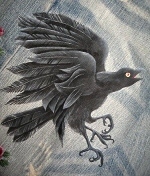 Yatagarasu is a three-legged holy crow (raven). It is a legendary creature. It is told that the Yatagarasu holy bird acted as a guide when Emperor Junmu, the first Emperor of Japan, went on an expedition to the east. Yatagarasu symbolizes sanctity and the sun.